You probably already know to avoid toxic chemicals like bleach in your laundry routine. But have you ever wondered about the safety of the other chemicals lurking in your laundry detergent? You might assume that the government has tested all the chemicals used in your laundry detergent for safety, but that’s not actually the case. Out of some 62,000 chemicals approved for use in the US, only about 300 have actually been tested for safety. Most people also don’t realize that laundry detergent manufacturers aren’t required to show their full ingredient lists on their labels. Another shocker is that the word “fragrance” on a laundry detergent can actually mask a cocktail of dozens of harmful ingredients. 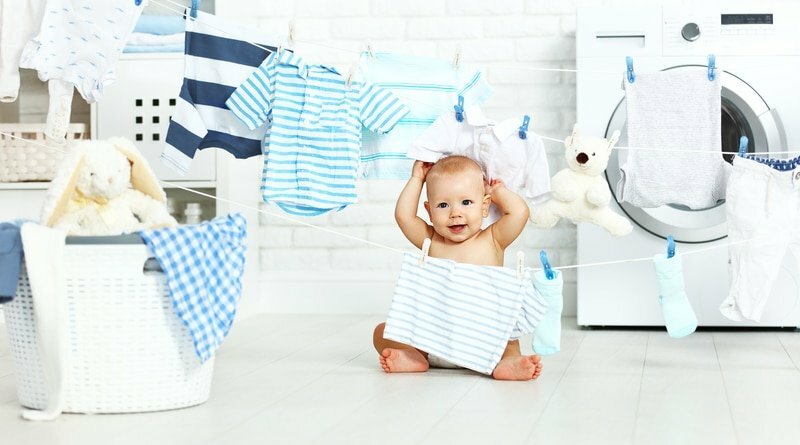 The Environmental Working Group (EWG), the authority on product & environmental safety, rates almost 70% of laundry detergents a D or F (their highest safety concern). Not to worry though, we’re here to help with the top offenders to avoid in your quest for a toxic chemical free laundry detergent. 1. Bleach: Just in case you need a reminder on the safety risks, sodium hypochlorite (bleach) is extremely toxic and dangerous given its ability to cause severe skin burns & eye damage, trigger dangerous allergy and asthma reactions, its link to cancer and organ damage, and its extreme toxicity if inhaled or ingested. 2. Fragrances: Fragrances in laundry detergents are designed to stay in clothing after washing, which means you should definitely be concerned about their safety. Fragrance chemicals can pass through the skin and enter the blood stream. They are manufactured from petroleum and coal tar and are classified as carcinogens, hormone disruptors, neurotoxins, skin and respiratory irritants. Unfortunately the fragrance industry is primarily self-regulated, where safety testing does not have to precede product sales and fragrance cocktails don’t even have to be reviewed by regulatory agencies. In household cleaning products like laundry detergents, fragrances are considered trade secrets, meaning that manufacturers aren’t required to disclose the potentially hundreds of ingredients hiding behind the one word “fragrance”. Step 1 in your pursuit of a chemical free laundry detergent is to say no to fragrances! Don’t buy it if you see the words “fragrance” or “parfum” on the label. And don’t be tricked by the phrase “fragrance-free” or “unscented”. You also have to check the ingredient list, because sometimes companies use a masking fragrance to cover the chemical smell of their product. Also watch out for products labeled as “natural” or “natural fragrance,” because there is no standard criteria for what these words mean. 3. Phthalates: These are often present in laundry detergent but you won’t find them listed on labels. They are typically associated with fragrances, so here is yet another reason to avoid fragrances. Across multiple studies, phthalates have been shown to cause hormone disruption. The Centers for Disease Control reported that phthalates can be found in the blood of most Americans, and the greatest quantities are in women. They can also be found in some plastic containers, so avoid detergents with recycling codes 3 & 7. 4. Sodium lauryl sulfate (SLS) and sodium laureth sulfate (SLES): Sodium lauryl sulfate has been linked to skin & eye irritation, organ toxicity, reproductive toxicity, neurotoxicity, endocrine disruption & ecotoxicology. The manufacturing of these also leads to a highly toxic & carcinogenic by-product called 1,4 dioxane. Nixing the SLS & SLES can go a long way in your quest towards a chemical free laundry detergent. 5. Brighteners: What’s creating the extra brightness from optical brighteners? It’s chemicals that actually remain on the clothes to absorb UV light & minimize yellow so that clothes appear brighter. EWG recommends that consumers stay away from these because of skin irritation and environmental safety concerns, and the EPA has said that these are potentially toxic. These ingredients aren’t always listed, so a helpful rule of thumb is that if the product is labeled as biodegradable, it probably doesn’t contain optical brighteners. 6. Phosphates & EDTA: Manufacturers use these to make detergents more effective in hard water. These chemicals have long been associated with environmental damage. They cause algae blooms that damage ecosystems. Look for phosphate-free on laundry detergent labels. Many detergents have eliminated these, but they’re often replacing them with ethylene diamine tetraacetic acid (EDTA) in its place, which has been found to be toxic in animal studies. 7. Quaternium-15: This chemical found in laundry detergent releases formaldehyde, which is a known carcinogen. It can trigger asthma, damage the respiratory system, and cause skin rashes. 8. Petroleum distillates: Petroleum distillates aim to do some good by removing grease from dirty clothing. But these chemicals have been linked to cancer and lung damage. Other names it goes by include aliphatic petroleum naphtha, petroleum naphtha, and rubber solvent. 9. NPE (nonylphenol ethoxylate) is a surfactant, a wetting agent that helps water penetrate into the fabric of your clothing. NPEs are hormone disruptors & suspected carcinogens. These are already banned in Canada and Europe. 10. Formaldehyde: This nasty one is classified as a human carcinogen by the U.S. government and World Health Organization and frequently shows up in laundry products. There are many health concerns associated with this one, including cancer, skin irritation, and organ toxicity. The National Institutes of Health warned that 1,4-dioxane is “reasonably expected to be a human carcinogen”, because it has been repeatedly shown to cause cancer in animal studies. It is also considered by the State of California to be potentially toxic to the brain and central nervous system, kidneys, liver and respiratory system. Many people who are searching for a chemical free laundry detergent will be tempted to use borax an alternative. However, according to EWG, it is a skin & eye irritant and suspected hormone disruptor based on animal studies. It is also toxic to children. We think it’s safest to avoid it. Besides avoiding these ingredients, another option is to incorporate a toxic chemical free cleaner & deodorizer like Force of Nature into your laundry regimen. Starting with just salt, water and vinegar, it has no toxic chemicals yet cleans as well as bleach without removing color. It’s great for pre-treating stains & eliminating stubborn odors in gym clothes. The fabrics used in athletic clothing are designed in a way that makes them hang on to odors, which you’ve probably noticed if you have any athletes in your family. If you spray them first with Force of Nature, you’ll remove the stubborn odors that laundry detergents can’t handle. And because it’s non toxic, it’s great to spray on baby clothes & bibs to get rid of stains and smells either as a pre-treatment or if you have a spill on-the-go.